Here at Smith Equipment we have the opportunity to work with several different interesting businesses. We do have a large group of agricultural customers who use Smith brushes – including Keith Evans President of Lion Habitat Ranch in near Las Vegas, NV! While most of our agricultural customers use our brushes for cleaning fruits and vegetables, to gently remove unwanted vegetation, aerate the soil, and even for pecan picking (blog post coming soon! ), Lion Habitat Ranch uses our brushes in a different way. One of the main attraction’s at the ranch is Ozzie the giraffe. 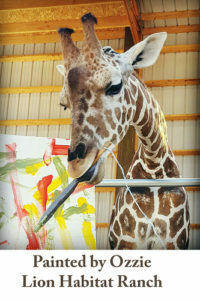 Ozzie is famous for his lovely paintings that he crafts for visitors of Lion Habitat Ranch, visitors even have the option of purchasing one of his work’s of art in the gift shop or online! So yes if you’re wondering – Ozzie is a very big deal! All artists deserve star treatment and Ozzie is no different. That’s why we’re excited that one of our very own brushes is used at the ranch as Ozzie’s scratching post! Whenever this long necked artist is feeling an itch – all he has to do is stretch his neck along our brush and he’s happy as a clam and ready to get is paint on. 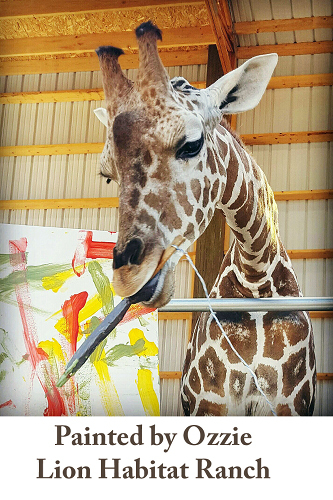 We have heard of our brushes being used to satisfy the itch in cows – but Ozzie is our very first giraffe and we are honored! 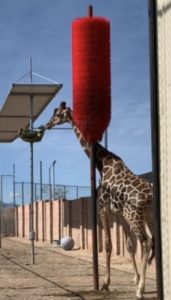 Not only are we ecstatic that our brushes are helping keep the star of Lion Habitat Ranch comfortable – but we love that we get to partner with such a great company! As we mentioned earlier, Lion Habitat Ranch is operated by Keith Evans who is very passionate about the mission of this wonderful non-profit. You may be wondering why we’re talking about a giraffe at Lion Habitat Ranch, but first and foremost the ranch serves as a conservation sanctuary for lions! In 1970 Keith began working closely with big cats and being able to nurture lions became his biggest passion. In 1989 Keith opened Lion Habitat Ranch in the hopes that visitors would fall in love with lions much like he did and in turn join in the efforts to protect and donate to wild lion habitats. So if you ever find yourself near the strip in Vegas, check out one of our very own Smith brushes in action at the Ozzie the giraffe exhibit at Lion Habitat Ranch! And while you’re at it make sure you purchase one of his masterpieces!